On the fourth of August 2016, a small boat docked at a sleepy little port town in Nusa Penida carrying five special passengers. As soon as the five passengers put their foot on the beach, they were quickly welcomed by our president, Bayu Wirayudha. Those passengers turned out to be the members of the Netherlands Royal Family. The group consisted of Prince Constantijn and his wife Princess Laurentien along with their children: Countess Eloise, Count Claus-Casimir, and Countess Leonore. The Royal Family Escorted by the Head of District and Our President. Their visit to this island is part of a long and continuous work dated back from 1993 when a biologist named Tony Whitten found a group of unusual crab inside a cave on the island of Nusa Penida. After thorough research Whitten, along with his colleague, Peter Eng discovered that the crab is a new species which later is known as Giri Putri Cave Crab (Karstama emdi). As the name suggests the crab can only be found inside the Giri Putri Cave which is located at Karangsari Hamlet, Nusa Penida Island. Since its discovery, there has been an intensive cooperation between us (FNPF), Fauna & Flora International (FFI), and the local community in Nusa Penida. The cooperation has produced a number of findings and recommendations that can help to protect the Giri Putri Cave Grab which is now considered a critically endangered species by the IUCN. The Priest Is Blessing the Information Board. As the Vice-President of FFI, Princes Laurentien’s visit is not only meant to assess the condition of the cave, but also to set up the information board in front of the cave. This board was built to raise awareness about the crab and to persuade visitor of the cave to protect the crab. The board is written in three different languages: Balinese, Indonesian, and English. 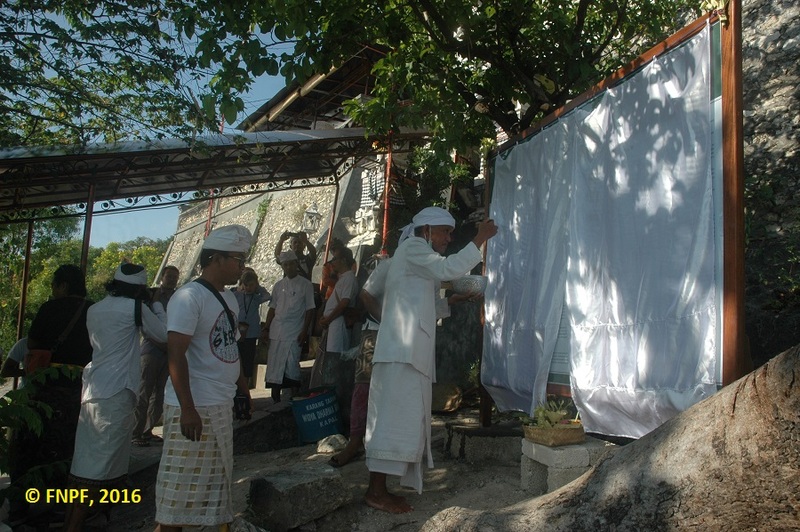 The board shows the visitors about the importance of protecting the crab as part of the conservation movement and religious duty because the crabs are considered citizens of the temple inside the cave. According to Princess Laurentin protecting the crabs is very important for biodiversity because the crab is part of the food chain. She gave an example about the decrease of birds in Borneo has caused an increase in locust swarm there. The Board Is Being Unveiled By the Princess. During the ceremony, Princess Laurentin stressed out the importance of biodiversity and how it can be protected through a strong cooperation between NGOs and local communities. She also pointed out the uniqueness about this project on how many people came together from different backgrounds to protect the rare Giri Putri Cave Crab. But as the Princess said during her speech “no animal is too small to protect”. After the speech the information board was blessed by the local priest and the Princess had the honour of revealing the board to the public. After the ceremony, the group was invited to explore the cave. The group was very surprised about the size and shape of the cave. The Count and Countesses were helping to find the crabs and were able to find one. 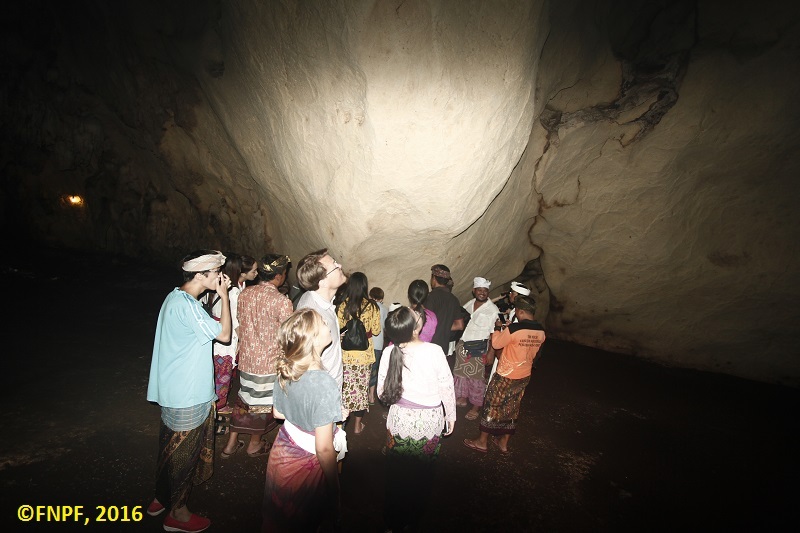 During their time in the cave the Royal Family asked many things about the story of the cave and its significance for the Balinese people. En outre, Princess Laurentin were also assessing the condition of the cave especially about the latest development in the last 10 ans. The Group Found the Crab. 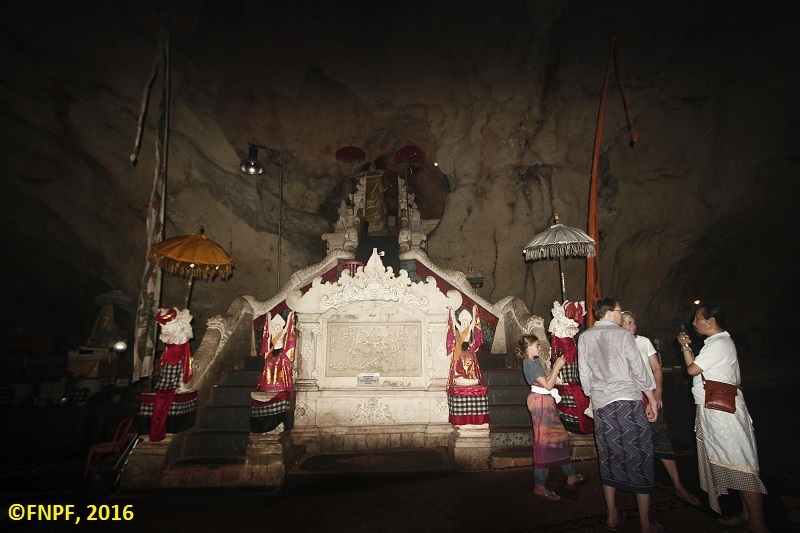 For decades, Giri Putri Cave has been a popular religious site for hundreds of pilgrims. Cependant, the advancement of social media and the improvement of infrastructure has brought more people to the cave. Donc, the condition of the cave has been drastically changed due to the increase of human activity. The cave is now equipped with a path way made from concrete blocks that separate the eastern part of the cave to the western part. En outre, electricity is also brought inside the cave which power the lights, the fans and the water pump. A significant increase of pilgrims has caused dramatically changed the ecosystem of the cave. The pilgrims brought with them a huge amount of incense which has changed the air quality of the cave. Our organization works with FFI and the local community to minimize the impact of the incense of the ceremony. Strategically located exhaust fans and pipes are being designed right now. These fans will be located where the smoke from incense is mostly gathered. The other solution is to encourage the local community to only turn on the light inside the cave when needed. The Princess Assessing the Condition of the Cave.